Hello there! 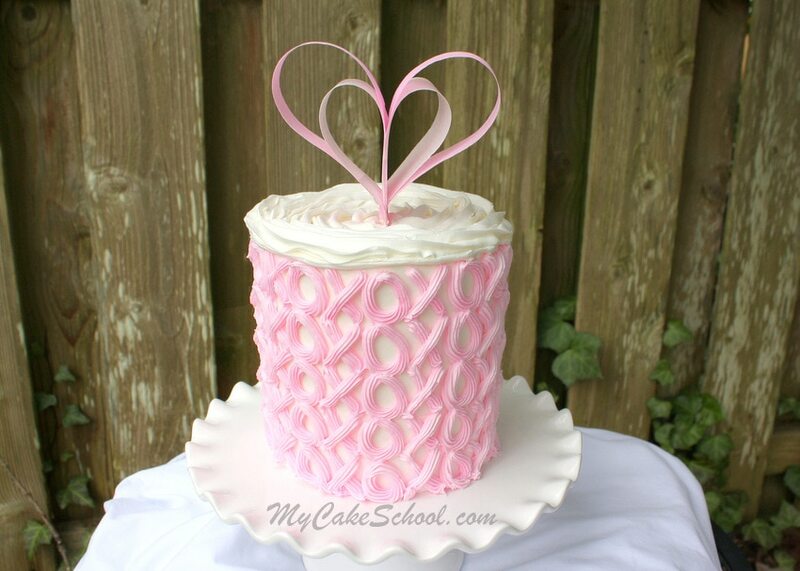 We are in Valentine’s Day mode with a Hugs & Kisses buttercream cake decorating tutorial that is SO simple & fun! 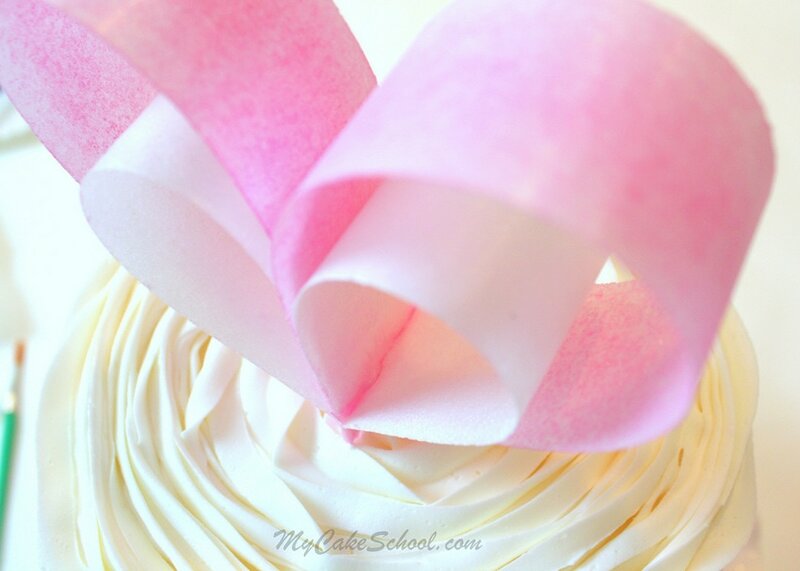 The main stars of our cake today are buttercream & wafer paper. First, I’ve frosted a six inch double barrel (tall, 4 layers of cake with supports and cake board halfway up) cake with a crusting vanilla buttercream. This cake would be adorable no matter what size cake you are working with. We used our Classic Vanilla Buttercream Recipe. Next, it’s time to smooth the buttercream. Just smooth as best you can with your preferred method. 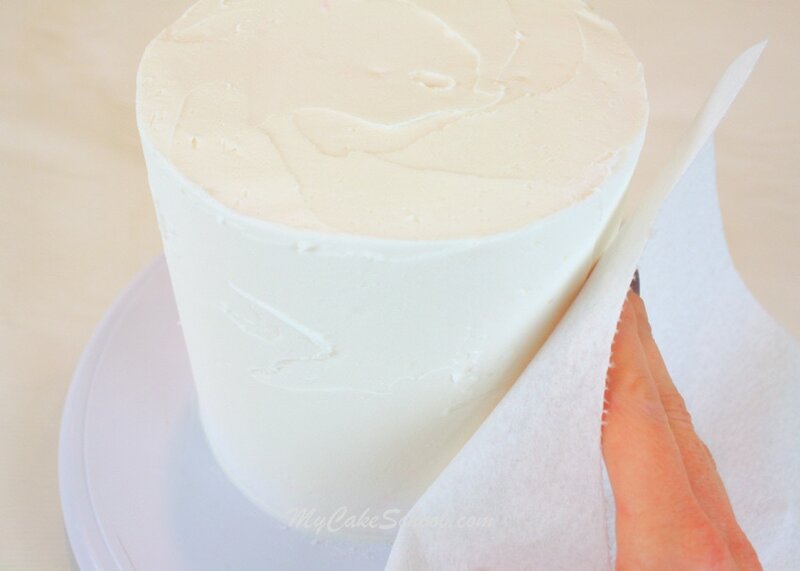 Here, I’m smoothing over the crusted Vanilla Buttercream with a Viva brand paper towel. (This is known as the “Viva Method of smoothing”. Viva brand is great because there is no quilting or impressions.) 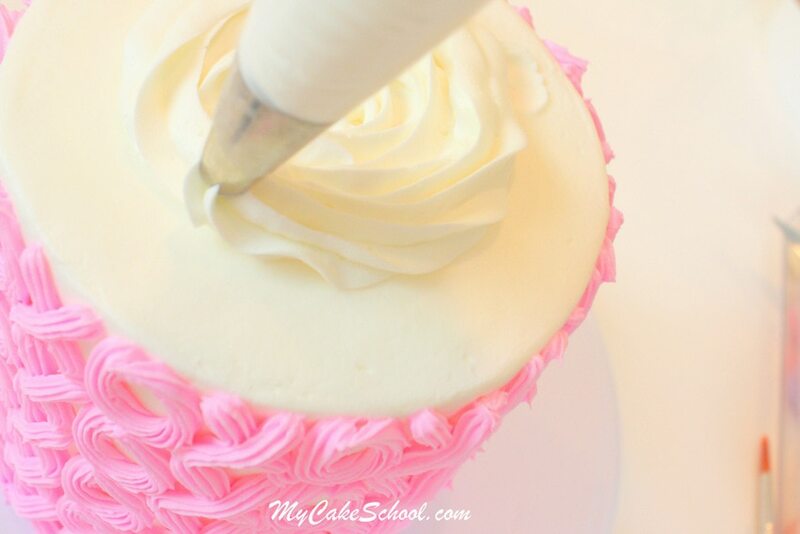 Chilling the frosted cake and smoothing with a very hot spatula is another good method! Next, we are going to cover this cake in hugs and kisses… or in this case, X’s and O’s! 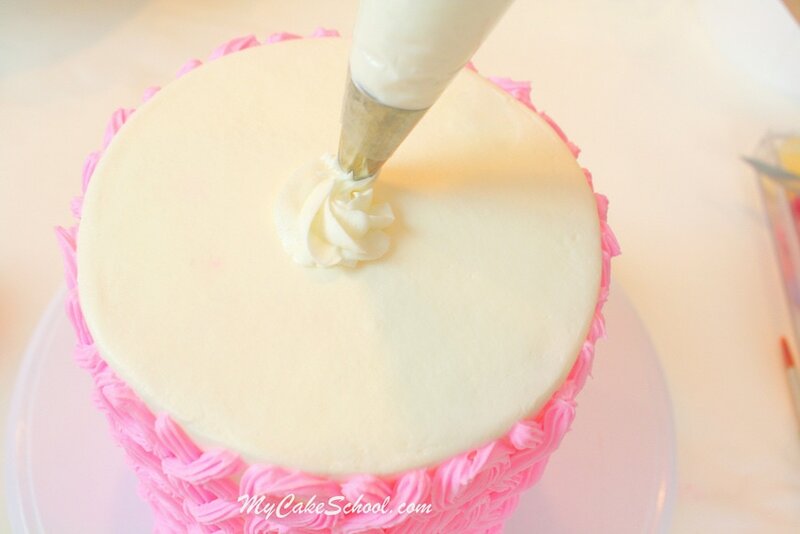 I’ve fitted my piping bag with a Wilton star tip 21, and buttercream tinted with Americolor Deep Pink. As you can see in the photo, the process is as easy as can be. Piping vertically row by row, I piped a row of X’s and a row of O’s. Repeat as you work your way all the way around! 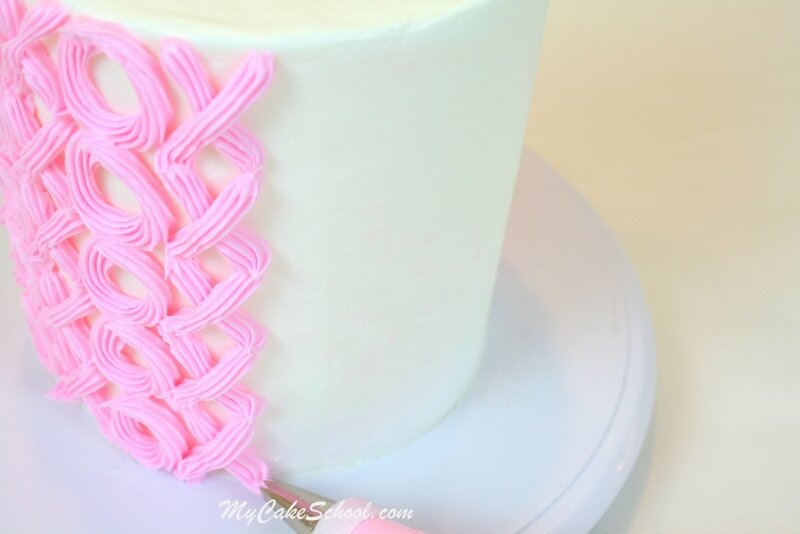 You can see that my piping is not perfect…with a freehanded design like this, you’ll always have some variation…but just keep going! It will look good in the end and those little variations here and there won’t matter. I love the playful and unique look! Now for the top! You can keep the top of the cake nice and smooth, but I decided to do a giant rose swirl on top with my Wilton 2D star tip. I started in the center and spiraled clockwise. I love giant rose swirls! Now, it’s time for a cake topper! Again, there are SO many options here. You could leave it just as it is, you could pipe a giant chocolate heart from candy melts, make a decorated heart cookie on a stick to stand vertically, or even scatter heart sprinkles…. but I decided to go with the medium that’s had a huge resurgence lately in cake decorating— wafer paper! 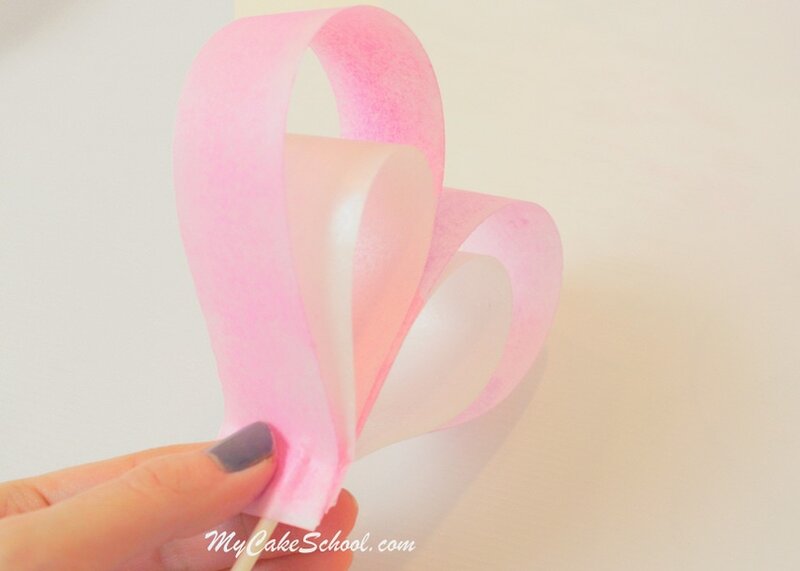 Here’s a quick and easy wafer paper heart topper…. (if you don’t have wafer paper, you could use card stock for a similar look!) 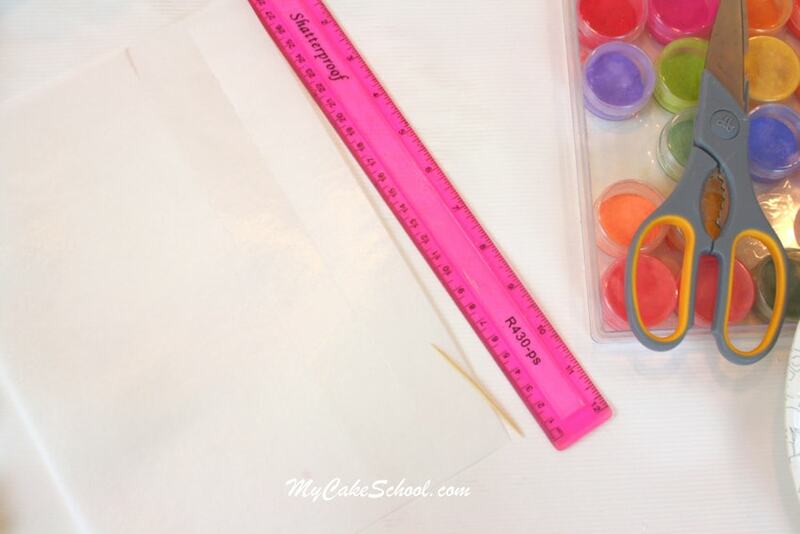 I took out a sheet of wafer paper and used a ruler and a toothpick to mark off 4 strips. Two were 11 inches long and the other two I snipped to 8 inches. Then, I colored the two longer strips of wafer paper on both sides with a dry brush and dry petal dust. (I used pink petal dust and Super Pearl dust.). 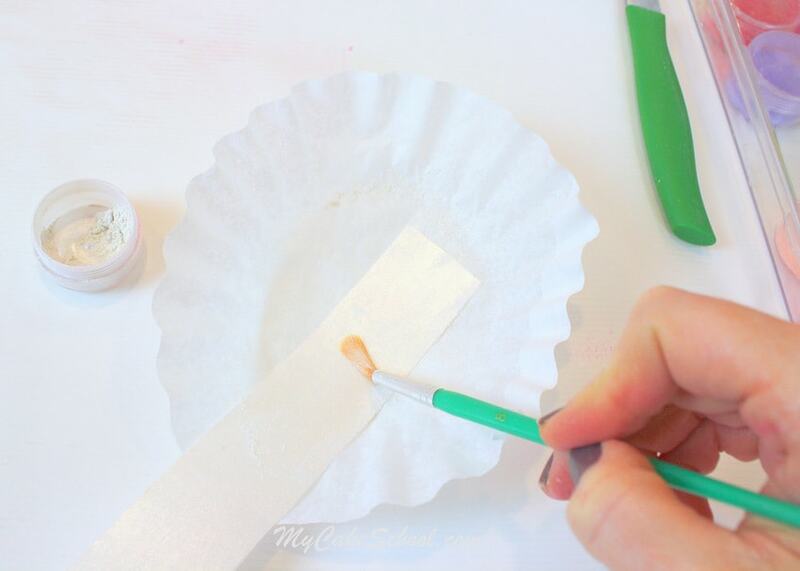 Brushing the wafer paper with a paint made from vodka and coloring gel wouldn’t work for this particular project, as it would ruffle the strips too much. 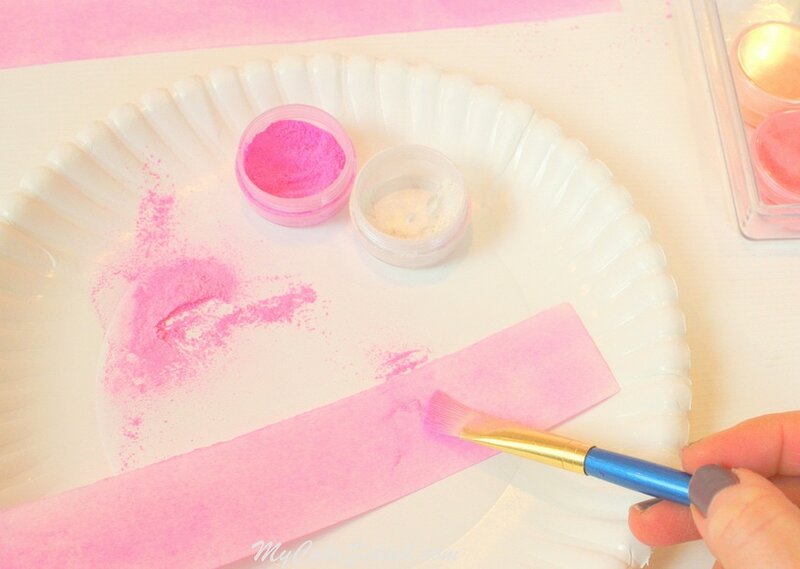 Petal dust is your best bet… although you could add polka dots or another pattern with a food coloring pen if you’d rather, or even leave them plain. I brushed over my shorter two strips with pearl dust. Then I pinched my strips together like this, using a tiny bit of dampness from vodka at the connecting points. You may need to hold it firmly for several seconds before it holds. If you don’t have vodka or alcohol based flavoring, a bit of water will do the trick…or even piping gel. I pinched both sides together with a lollipop stick in the bottom center. The lollipop stick acts as our anchor. I just squeezed the lightly dampened bottom of the wafer paper around the stick and held it for a few seconds. Finally, I pushed the topper right into the cake. I haven’t had any trouble with wafer paper on crusting buttercream…but I haven’t tried it yet on non-crusting frostings with a much softer consistency. To be on the safe side in these cases, you may either want to do a trial run (with a piece of wafer paper on the frosting), or simply add the topper just before your event. 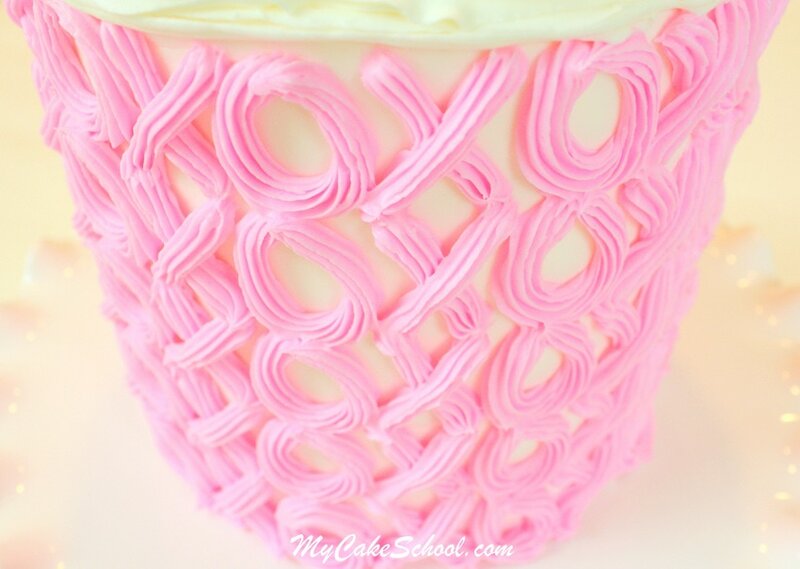 Looking for more CUTE Valentine’s Day cake and cupcake ideas? We have a roundup of our favorite Valentine’s tutorials here! 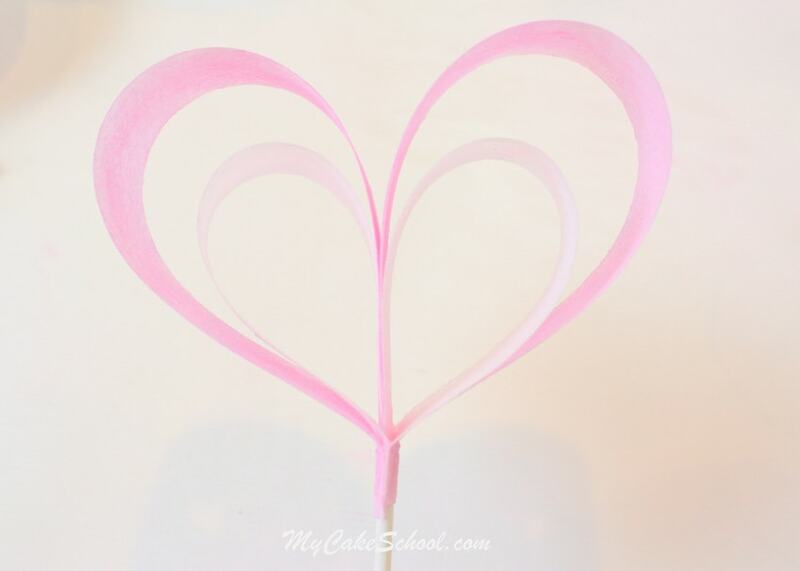 : Valentine’s Day Cake and Cupcake Tutorial Roundup! Thanks for stopping by! Don’t miss our full collection of FAVORITE cake recipes, frosting recipes and more in our Recipes Section, and our full collection of FREE Cake Tutorials and Videos! Beautiful as usual and your instructions are always easy to follow. I too am getting into wafer paper. Got 100 sheets on Amazon for roughly $12. Hi! Can you give your butercream recipe? Please. Pretty and simple. Love it. Oh pretty pretty. I am a hopeless romantic. This cake works for me. ♈ōϋя fondant looks smooth,white Α̲̅πϑ perfect,. Pls what’s ♈ōϋя fondant recipe. Am having trobles with mine. Tanks I will apreciate ♈ōϋя response. Hi GiGi, thank you. This cake was frosted with a crusting vanilla buttercream, and smoothed with a paper towel. Looks beautiful ,I can’t wait to try this one soon! Hi Melissa! This is a gorgeous tutorial! I was wondering where you got your beautiful set of petal dusts? I am having the hardest time finding a vibrant set like yours. Hi Stephanie- Thanks! This actually isn’t a set of dusts that I bought. I’ve just emptied the petal dusts that I’ve accumulated into this empty set of containers (and storage box) that I found at Michael’s a while back. (The screw tops are easier to open!) ;0) – My colors are from various places…but probably most were ordered from Gloabal Sugar Art.